The list below of manufacturers of scale model kits is not intended to be exhaustive, but does offer some guidance on the major model makers, especially for scale models one is likely to encounter in the United States. I don't know all of the model manufacturers from around the world - does anyone? - but am often intrigued to learn of manufacturers I've not heard of previously. Please accept in advance my apologies if your favorite brand is not yet on the list. Thanks to the internet, model builders are no longer restricted to the selection found in one's local hobby store, which greatly enhances the availability of models from certain manufacturers. On the other hand, please do patronize your local hobby store when you can; the more models one buys from a local store, the more models that store will carry. AMK Models / AvantGarde Model Kits. Founded in 2012. 1/48 scale aircraft models. Aurora. Aurora scale models were manufactured on Long Island and were popular in the 1950's and 1960s. The company changed hands several times, and now appears to be defunct. Eduard. Eduard makes model airplane kits in the Czech Republic. Their website is located at http://www.eduard.com/ . I actually have five of the company's basic kits, of which four are models of World War I era airplanes, including the Morane-Saulnier type L.
Hasegawa Models. Japanese manufacturer of plastic scale models since 1961. Wide range of subjects, including aircraft, armor, automobiles, sci-fi and figures. Hobby Boss. Hobby Boss scale models come from China, specifically Guang Dong. Their offerings are primarily military. Italeri. As you might have guessed, Italeri is an Italian company, in business since 1962. I've never had the pleasure of building an Italeri model, but some of the items on the company's website ( http://www.italeri.com/ ) look intriguing. Kitty Hawk. I don't really know anything about Kitty Hawk, except that they have a model of the North American Aviation T-6 Texan that looks great. Meng Model. Meng Models are Chinese. The company offers both automotive and military models. Minicraft Models (US) LLC. Based out of Rockford, Illinois, this company has an extensive line of aircraft models in different scales. Their website is located at http://minicraftmodels.com/ and is worth a look. Monogram. Monogram is a Revell brand. 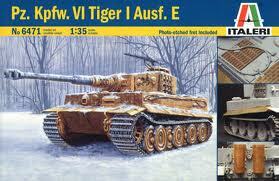 Since they have the same distributors, you'll often find Revell and Monogram models offered by the same store. MPC. Like AMT (see above), MPC is now owned by Round 2 LLC. The website is located at http://round2models.com/models/mpc . Panda. As you might guess from the name, Panda is a Chinese company, specializing in armor scale models. Website no longer exists, so we are not sure of the status of this manufacturer. Revell. Revell is probably the most widely recognized brand of scale models in the United States, and has been around since 1945. The company is headquartered in Elk Grove Village, Illinois. The company was purchased in 2007 by Hobbico, which is a 100% employee-owned company. The quality of Revell models is usually high, and their product line of model cars, model aircraft, and model ships is huge, with about ten new models offered every month. Revell also does a great deal to promote the hobby in the USA, including the National Model Car Championships. I've happily built many Revell models over the years. The company's website is located at http://www.revell.com/index.html . Toxso Models.Maker of military models based in Hong Kong. Trumpeter. Also from China, Trumpeter offers a variety of military scale models. Website for this manufacturer has also disappeared so, again, their status is unknown to us. Zvezda Plastic Models. Russian manufacturer, founded in 1990. Company website states that, " more than half our range of products are military, commercial aircraft, and naval scale replicas of vehicles and machinery."